I’ve argued before that there are no good songs about how lovely small children are: some counter-examples were raised in the comments box, but not many, and this surely wasn’t one of them. 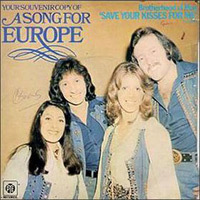 “Save Your Kisses For Me” is the kind of chirpy material that used to give Eurovision a bad name before the smirkers got hold of it: catchy, but too winsome to really enjoy. I’d point to it as a classic example of cynical Britain fobbing off any old rubbish on the song contest, except Brotherhood of Man actually won the thing. Especially heinous elements: the root-i-toot toy trumpet riff, the persistent triangle accompaniment, the “awwww” final chords after the twist. THE TWIST. Path to redemption: the opening irresistibly reminds me of “Mother’s Little Helper”. It was during this record’s run at the top that an era sadly ended with Pan’s People’s last appearance on TOTP. They did two numbers first “More More More” (Andrea True Connection)and finally “Silver Star” (Four Seasons) which featured an extended solo spot for Ruth (the only survivor from the original line up). All I can say (apart from lamenting the lack of a zero) is…had it not been for some of the “twist” references here, there’s no way I would otherwise have listened to that all the way through. What unutterably dreadful tosh. Regarding the twist ending, it makes me wonder if Michael Buble’s ‘Haven’t Met You Yet’ would be improved by saving the title line until the very end of the song…so he talks about this girl for four minutes, but wait, he hasn’t met her yet! Obviously you’d have to change the title as well. Tom: “there are no good songs about how lovely small children are”. Also, as mentioned elsewhere, “You Came” by Kim Wilde. Can’t think of any more recent ones offhand though. The entire of the most recent Kelis album is about her kid, and it’s all absolutely terrific, probably the best pop record of last year. So I’ve changed my tune on the idea of songs-about-kids to some extent. But this is still an atrocity. #65, add the Kinks’ “Days” plz. Mark @68 – I’ve never heard or read that “Days” is addressed to a child. Hast thou evidence? “Kooks” is fun, but twee by the Dame’s standards. “Isn’t She Lovely” by Stevie Wonder to twee? #70 re: Days, I can’t find anything that backs it up! @71 Glenn Shorrock with long hair! Crikey. A bit before my time, I’m afraid (I was two in 1970), and I don’t remember noticing it on Oz radio in the ’80s/’90s. More enjoyable than Save Your Kisses, though, which unfortunately I remember all too well. Erithian, reading your post at #21 has disabused me of a long-standing assumption that Manchester United’s eponymous Number 50 smash was sung to the tune of “Winchester Cathedral.” Well, it should have been. As long as you support us we will never have a feeeeeeaaaarrrr…..
Ah, so is it to the tune of “United We Stand”, the early seventies hit by .. (hang on, i’ll look it up..) ..
No, but I guess once you get hold of a good lyrical theme you hang on to it! You can sing Mother’s Little Helper to the tune of SYKFM. Pretty much. Great improvement. I watched the promo for this…somehow I survived. Gotta say, the worst part by far was the end after the ‘you’re only three’ lyric, they all did a “see what we did there?” arms cross. Ughh. I don’t share the utter contempt for this record that others evidently feel. Why might that be I wonder? Well, until just now, I’d never known what era this record came from, and I’d assumed it was a kind of a Carpenters’ Top Of The World knock-off from 1972/1973. Heard that way, SYKFM sounds almost logical – I mean, if you gave SYKFM to The Carpenters and the Wrecking Crew they’d *make* you love it, and a ‘Memphis, TN’ twist, well, why not? It’s squicky but funny, and it’s not as though pop ever has an excess of either wit or twistiness. So, I wonder whether the particular venom that SYKFM has attracted here is due in part to its atavism – the pop world had seriously moved on by ’76 and the slight monstrousness or monstrous slightness of those ’72 pop stylings *really* rub people the wrong way when delayed. Anyhow, I gave Whigfield’s ‘Saturday Night’ a 2 or a 3 (begrudgingly upgraded to maybe a 4 after repeated listens), and I think SYKFM is slightly better than it in every respect (I’d always take SYKFM over SN to cover), so I say this is a 4 (maybe a 5 on the right day). All right, I’ve never knowingly heard this before tonight, although it apparently reached #27 over here. Clearly this hasn’t aged well, but perhaps my enjoyment of being a godparent, or simply the fact I haven’t heard it enough to annoy me, means I have a hard time hating it as everyone else except Swanstep seems to. I’d also give it 4, maybe 5/10. Second time this week I’ve semi-defended an extremely unpopular track on this forum – wonder what’s wrong with me! #2 watch note: Had no idea Billy Ocean was having hits this far back. Always thought of him as 80’s only. Worst UK winner. That’s all.